An adventurer dad is a role model dad! Girls may like dolls, but boys DEFINITELY love adventure. We know where to find it! "He´s missing a father figure," divorced Pavla complained. "My ex-husband used to go for a wander with a backpack when he was young, but, as he got older, he got lazier and he actually never took the boys anywhere," she sadly remembers the times when she was looking forward to seeing the beauties of the world not only with her husband but also with their two sons. But life brought her the role of a woman who must work very hard to support her boys and there is no time left for expeditions. Complaining about a missing father figure can be heard from several places. Every boy reading adventure books by authors like Karl May or Jules Verne would like to be friends with Old Shatterhand or Captain Nemo. But where nothing is, nothing can be had. Or is it not so? Isn?t our hero within arm?s reach and we are too lazy to admit it? One of the most common excuses why something is not possible is lack of time and work commitments. Except that we only have exactly as much work as we allow. It is no accident that the most successful ones are in their positions because they can relax. Those who cannot end up broken in psychotherapists? chairs. Here in Gargano we offer a unique opportunity to become not only an exemplary daddy, but also a dream hero, who can start a fire, is not afraid of the sea and can even steer a ship. Under the supervision of an experienced captain, of course. Important things all too often have an easy solution. Nobody questions the fact that raising children is important, but quite a few people immediately bring up the lack of time, the need for career advancement... and many other excuses. If we dads admit that we want to be role models for our children, we can simply take a holiday and just do it. Southern Italy is a safe exotic destination, the accommodation in a fully equipped MASH tent is on one hand comfortable and on the other it does have a taste of exotica. And moreover, you can speak Czech with us. And just between us, we?ll tell you a secret your little pirate does not need to know. We have full Wi-Fi coverage, which means that you can OCCASIONALLY check what is going on at home or at work. It is more of a communication safeguard, which is best not used; you might want to fully commit to boyish adventures instead, since there is a little boy in every man throughout his life. Each member of a family sometimes feels the need to be alone or with their kind. Men go fishing, ladies go to a coffeehouse or from time to time have a ladies? night, whatever the pretext might be. When big and little men are together, the social role of ?the man in the family? strengthens and moreover it gives the other half an opportunity to have fun, relax, unwind. Simply a win-win strategy when absolutely everybody benefits from a short men?s holiday, even the female part of the family. There is only one "but". Taking the first step. Contacting us. Everything can be arranged, organized, recommended, shown, planned. We have a ship, know the surroundings and let?s not pretend: even we are fulfilling our dreams and desires. And what happened to Pavla from the beginning of our story? She found a new partner, who is not afraid to take a backpack and takes the boys away for the weekend or for a part of the summer holiday... and who knows, perhaps he can steer a ship. And he doesn?t need the assistance of the mum. Guys can cope by themselves, right? 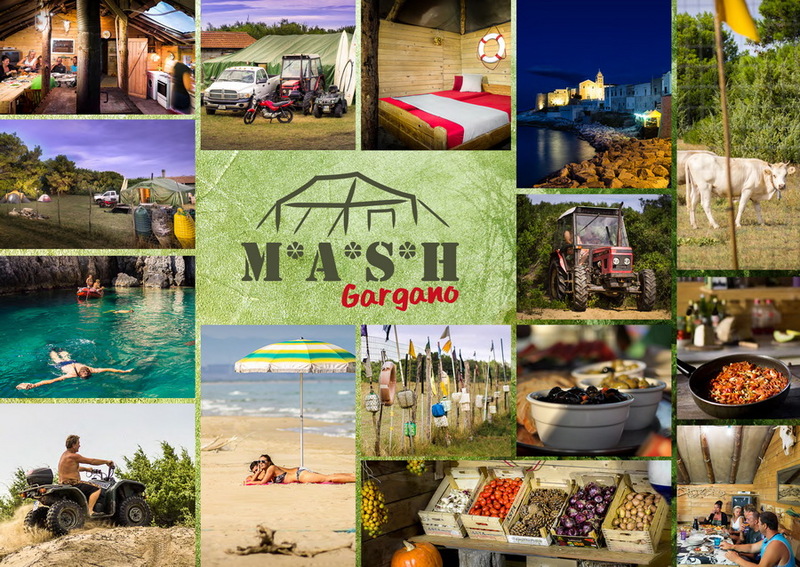 MASH Gargano, the forgotten part of Italy with its own natural resources! MASH Gargano is a small camp and fully reflects its name. It is a nature reserve and is situated in Parco Nationale del Gargano between the Lesina lake and the Adriatic Sea. There is a beutiful and abandoned sand beach just a few meters away from the camp. MASH is the ideal place for your activities that will not be disturbed, local gastronomy, sports, teambuildings and also a quiet family vacation with your kids or dogs. 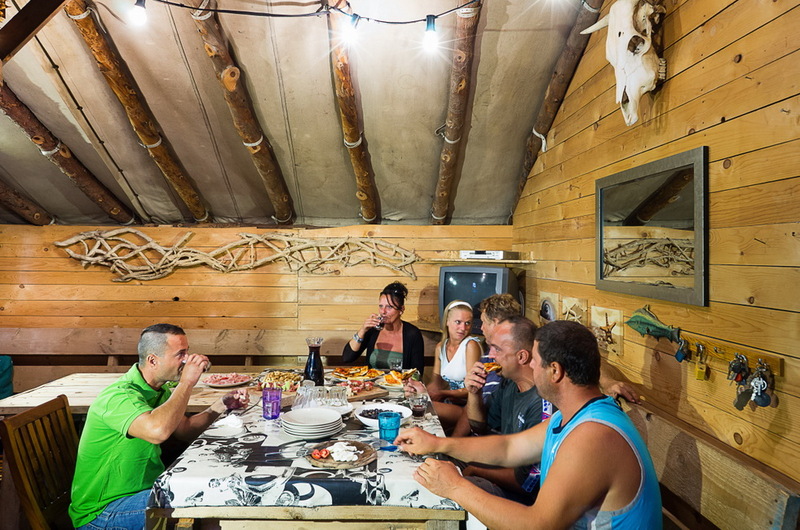 The camp lies on a 5.000m2 land and offers two accommodation capacities: a fisherman's house and a big „MASH“ tent with a solid floor. We also have place for a couple of tents available, a big common room with a huge kitchen, social supplies with an original outdoor shower and a little bio farm with vegetables that is available for visitors. Do you want to spent your vacation without any tourists on an untouched part of Italy and still be close enough to tourist destinations like Viesta or the Termiti islands? Near MASH lies a sand beach that is there just for yourself. Here you can go on romantic walks and experience the local Italian shores. MASH and the area around it is very quiet place to be. You can try out various adrenaline or teambuilding activities in MASH. 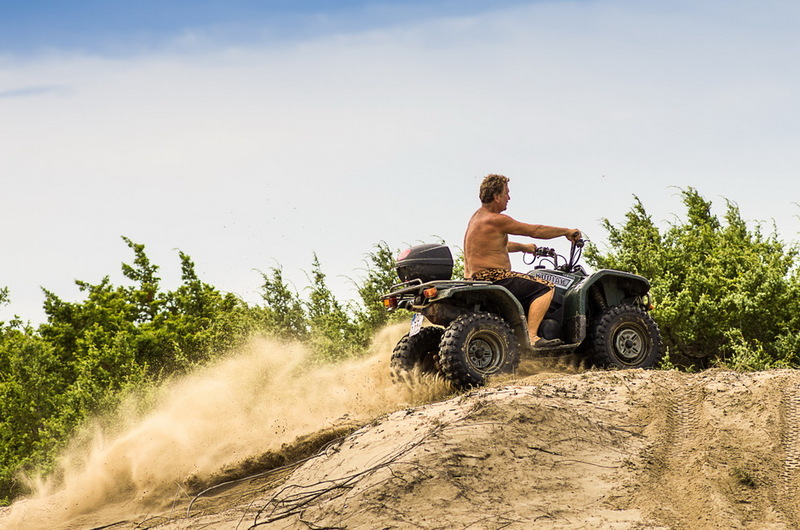 It could be a ride on the beach on a quad, with a tractor on a sand dune, a trip with an offroad into the nature, fast boat ride, net fishing, surfing or beach volleyball. In the afternoon we can cook the fish you caught or other local specialities in our spacious kitchen. Nearby MASH is our junk Esperanza, which sailed through Europe from Prague to Gargano in 2013 and is fully avaliable for you. Up to 12 people can be seated on her fully roofed and covered deck and is ideal for trips around the area like the Tremiti islands, diving, fast boat or water-skiing rides and barebecue. We offer a 20% discount on Esperanza to our MASH visitors. 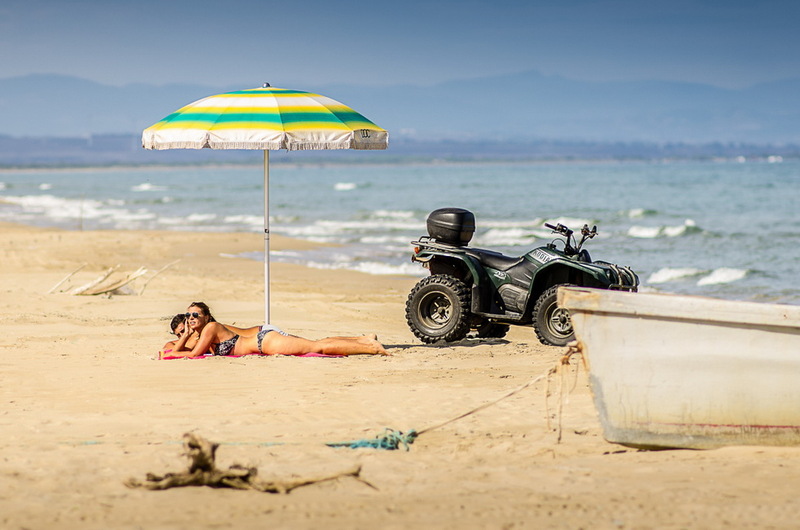 MASH lies about 15km from Capoiale, which is situated on a peninsula called Gargano, that is about 70km from Viesta, on the border with Varano Lake and the dam, which separates the lake and the Adriatic Sea. Visitors will find themselves in a nature reservation with the possibility of enjoying the long and lonely sandy beach. The advantage of this area is the absence of crowds of tourists, therefore you can fully enjoy your vacation.